We also hear the same concerns or misconceptions regarding flu. So, we’ve compiled this list of common flu myths − to not only debunk them, but also to help you protect yourself from catching the flu from your co-workers. Getting a flu shot is a healthy choice for you, your family, and the entire community. The more people who protect against the virus, the less flu there may be in general. According to a study published on The National Center for Biotechnology Information, the flu causes U.S. workers to miss up to 111 million workdays resulting in an estimated $7 billion spent a year in sick days and lost productivity.2 For these reasons, workplaces often host flu shot clinics right in the office to minimize absenteeism, so take advantage of the opportunity if your company offers one. And don’t forget to have your family members vaccinated at your physician’s office or local urgent care center. The best time to get a shot is before the season actually starts because it takes two weeks for the body’s immune system to fully protect itself against the flu. Flu season can start as early as October but generally peaks in January or February and can last until May. It’s a long season, which means those who haven’t received a flu shot are at increased risk for contracting the flu. Get vaccinated before it starts spreading through the office. Flu vaccines given with a needle, which is the recommended method, are either made with an inactive flu virus or no virus at all. This means you will not get the flu from getting the shot. There may be some minor side effects, however. The most common are soreness, redness, and swelling where the shot was given; headache; muscle aches; or a body temperature above 98.6° F and below 100.4° F. It’s easy for some to confuse these symptoms with the flu, but they are side effects that go away rather quickly. That’s not to say that it isn’t important to keep your workspace clean and regularly sanitized. We identified some of the germiest places in the office that you’ll want to disinfect more often. While both colds and the flu share many symptoms, remember that the flu is often accompanied by extra symptoms like high fever, headache, body aches, and feeling completely wiped out. Because it can cause more serious health complications, such as pneumonia, sinusitis, or dehydration, it is advised to seek medical attention if you are experiencing any flu-like symptoms. Even if it turns out that your illness is a “flu imposter,” it’s better to get treated for whatever is ailing you sooner rather than later. Over time, immune system protection offered by the flu vaccine decreases and doesn’t protect from year to year. Since the flu strain is different every year, it’s important to get a flu shot each year to protect against the flu virus.1 It’s good for you and it’s good for those around you, and limits the opportunity to spread the virus further. Aside from the flu shot, the best ways to beat the flu are to get plenty of sleep, eat well, disinfect shared surfaces, and wash your hands often with soap and warm water. Make sure you stay home from work until you are feeling better so you don’t contribute to spreading the illness to your co-workers. The Centers for Disease Control recommends that workers who have a fever and respiratory symptoms stay at home until 24 hours after their fever ends, without the use of medication. Keep in mind that not everyone who has the flu will have a fever, so use your best judgment on when you are feeling well enough to return to work. Now that these common flu myths are busted, you can go into the season, and into work, with peace of mind that you’re prepared to ward off the flu. 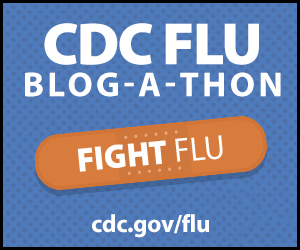 MedExpress is proud to be part of the CDC’s Flu Blog-A-Thon and you can too. The CDC is encouraging others to post blogs on the importance of the flu shot. Look for other participating blogs with the hashtag #FightFlu. It’s not too late to get a flu shot, so let’s spread the word. NFID News: Do You Know These 10 Important Facts About Flu Prevention?